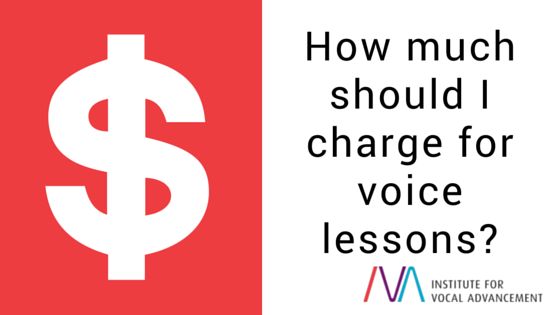 You are here:Home Hints and Tips How much should I charge for voice lessons? For voice teachers who are just starting their career, it can be difficult to set up a pricing structure that balances becoming financially successful with also being attractive to potential students. Charging too much will make singers hesitate to book with you, and they’ll likely choose your competitors who charge less and/or have established reputations that put them in higher demand. Charging too little will leave you frustrated and might cause some of your students not to value your service. So what is a good way to find a pricing structure that sets you up for success by making your business grow while also building a good reputation? When working on a pricing structure for your services as a voice teacher, you might want to inquire about the prices of the competitors in your area. Depending on what kind of lessons they offer and what their level of experience is, you want to make sure that you are not too far below or above their rates. If there is no immediate competitor in your nearby area, lucky you! But you should still check out the market price of music lessons in general. Usually, voice lessons are slightly higher than the price of instrumental lessons. If you have studied voice and/or vocal pedagogy at a university, it is a given that you might want to charge more than a voice teacher who did not receive a similar quality education. The same applies to your level of experience. When starting off as a voice teacher, you want to leave plenty of room to increase your rates as your level of experience increases. If you are part of a professional voice teacher organization for ongoing education, like the Institute for Vocal Advancement (IVA), and therefore have a reputation of high-quality-lesson standards, you will always be able to charge more than the competitors in your region, and you will continually have more and more to offer. This statement is not necessarily meant in a spiritual way, but in a really practical way. Your lesson rates should be high enough so you feel that your level of experience and the quality of education you have received up to that point are respected and valued. At the same time, your rates should be low enough so that you don’t feel the pressure of having to deliver voice lessons at a standard that you don’t feel capable of achieving yet. When is it time to increase the rates? After building a client base and reputation in your region, you will eventually consider increasing your rates. So when is a good and appropriate point in time to raise your prices? When your lesson schedule is completely filled every week, and you start a waiting list for new students. When you earn higher credentials and feel an increase of value in your lessons. When it has been quite a while since you last raised your rates. A good way of increasing the rates is to raise them for new students only and keep the old rates for regular students for a while. Before increasing for everyone, you might want to offer time-limited package deals to your old students so they can still take advantage of the old price. As always, you might want to make exceptions to the rule when increasing your prices. If some of your current students cannot afford the increased rate, think about giving them a discount so they can keep studying with you.